The Body Shop are always on top of their game when it comes to gifts! They have launched a new limited edition range of one of their best selling skincare ranges which I think would make a gorgeous gift for mothers day! The best selling Vitamin E range has been given a majestic, regal makeover for mothers day; also a new product to the original range has been added which is one of the most exciting skincare products that I have seen so far this year. I have the *Limited Edition Vitamin E Moisture Cream (£17, 100ml), *Limited Edition Overnight Serum In Oil (£13, 28ml) and the brand new *Limited Edition Vitamin E Eye Cube (£8, 4g) - I am particularly excited about trying the 'eye cube' and the serum in oil. Firstly, the packaging redesign is gorgeous! I love The Body Shop's take on the Union Flag and regal inspired design. I have tried the vitamin E night cream before which my skin didn't really get on with although I tried it when my eczema was very bad but I have been using the serum in oil and eye cube for the past few days and so far so good! I'm going to give the moisture cream to my mum to see how she gets on with it. The eye cube is such a unique product, it is a silky smooth, cooling eye cream in stick form so it is great for travelling, fuss free hydration and instant illumination. Overall, I think this range would make a lovely gift for Mother's Day, especially of those mums who don't spend time on themselves. The products seem so nourishing and the vitamin E range is one of the best selling skincare ranges from The Body Shop. The limited edition packaging, in my opinion, makes it a bit more special. The Body Shop have so many gifts to choose from so I have picked out some of my favourites - I would love the try the Wild Argan Oil and new Smoky Poppy ranges! Have you tried any products from The Body Shop's Vitamin E range? Will you be buying your mum a gift from The Body Shop? This is a great idea. :) Love your blog. Can I buy this for myself? Haha and my mom of course! I love The Body Shop and the packaging looks wonderful. I haven't tried the Vitamin e range, but I love the Wild Argan Oil Collection, especially the Hair and Body Oil (which I use on my hair almost exclusively). The Body Shop is always an amazing place to shop, I love going there. 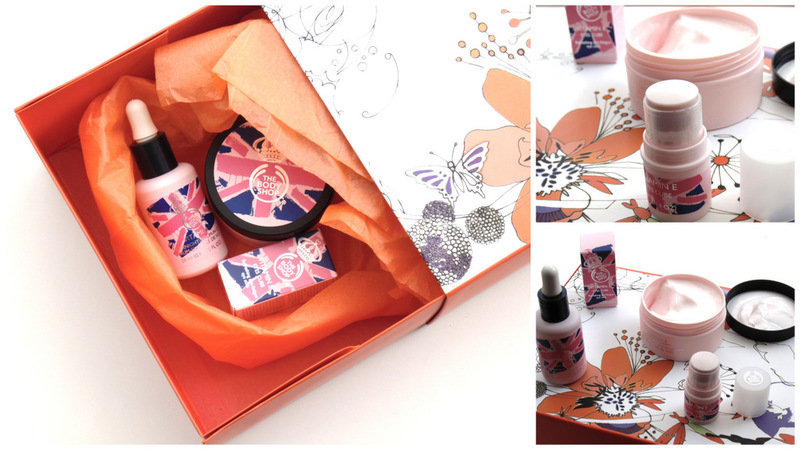 I really love the union jack packaging, it's so nice! Ooo the vitamin e cream looks good, I think I'm going to need to pop into Bodyshop before Sunday, as my Mum loves everything in there! That is a fantastic gift set, might just pick up one for my MIL. I've been wanting to try the Vitamin E range for ages now, the limited addition products look great - this may be the time for me to try! I actually haven't tried anything from them, but the packaging is very cute! I bet it smells even better. The Body Shop is always a winner in my house, just need to get it past me first! Same, I love their products and my mum does too! The Body Shop is such a great place to go for gifts when you don't know what to buy! The set you got looks lovely!